Russia’s civil aviation industry, whose main project is the regional aircraft Sukhoi Superjet-100 (SSJ-100), is to receive record state support, with the government promising anti-crisis funding of more than 127 billion rubles ($2.5 billion). According to observers, the financing will help to support production of the Superjet and demand for the plane from airlines. The Russian government has unveiled a financial aid package to support its civil aviation industry as the economic crisis continues to bite, with the manufacturer of Russia’s first civil aircraft since the fall of the USSR set to receive a record-breaking tranche of state funding. Deputy Industry and Trade Minister Andrei Boginsky announced on April 24 that the government is to allocate 27 billion rubles ($524 million) from the budget to support Russian aircraft leasing companies, along with a 100 billion ruble ($1.9 billion) recapitalization of the United Aircraft Corporation (UAC), assigned to the Sukhoi Civil Aircraft Company (SCAC), manufacturer of the SSJ-100, also known as the Superjet 100. Boginsky, who said the decision was taken at a meeting in late March with Russian President Vladimir Putin on support of the civil aviation industry, estimates that leasing companies will be able to acquire about 50 aircraft over the next three years as a result of the distribution of state funding. In the future, the aircraft will be offered for lease to operators, while government support will help to ensure an acceptable rate. Criteria for the allocation of funds have not yet been formed, Boginsky said, but priority will be given to the leasing companies that are already working with regional carriers. Kommersant sources familiar with the situation say that such a large amount of government aid for the UAC, and primarily for the SSJ-100 project, the first civil aircraft manufactured in Russia since the end of the Soviet Union, is "largely due to the need to support the demand for this aircraft at any cost in crisis conditions, given that the project has already cost billions of dollars." A source in one of the regional airlines explained to the newspaper that regional carriers are not willing either financially or technically or economically to take the SSJ-100; given the average load, 70-seat aircraft are needed on regional flights, while the SSJ-100 has 98 seats. 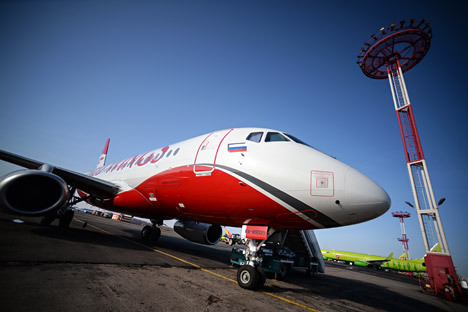 As a result, the source admits, only the offer of SSJ-100 for lease to operators at ruble rates can significantly increase interest in the aircraft. Independent aviation expert Andrei Kramarenko believes that the unprecedented support for civil aviation, primarily the SSJ-100, is largely related to the fact that it is one of the few examples of Russian-built machine products that can be demonstrated both at home and abroad as a "national industrial achievement." What will other manufacturers get? Taking into account the earlier decision on a 100-billion-ruble recapitalization of the UAC, the Russian civil aviation industry will receive the largest amount of state support in comparison to the country’s other machine manufacturers. For example, 28.5 billion rubles ($553 million) has been allocated to support the automotive industry (taking into account the state recycling program as well as programs for preferential car loans and leasing). Supporting the largest manufacturer of freight cars and tanks, Uralvagonzavod, could cost the state 105 billion rubles ($2 billion), but the allocation of funds is yet to be approved. Other manufacturers are asking for a more modest amount of aid – the amount of state support they are demanding is measured in the tens of billions of rubles. In the case of a number of industries (for instance, shipbuilding or the machine-tool industry), state support is provided under programs approved before the crisis in the Russian economy entered its active phase. First appeared in Russian in Kommersant.